Laser Skin Rejuvenation - Advanced Skin and MOHS Surgery Center, S.C.
Cutera’s LimeLight delivers a non-invasive light treatment that can be customized for different skin tones and aging skin, resulting in an exceptional skin revitalization treatment with minimal discomfort. The LimeLight Facial is ideal for face, neck, decollete, hands with any brown spots, skin redness, or telangiectasia (tiny veins). In addition to treating sun spots and vascular concerns LimeLight also balances color and improves your complexion. Beautiful, glowing skin achievable in as little as one treatment. The Titan anti-aging uses a unique light source to create a thermal profle in the dermis to tighten the skin and stimulate collagen growth. It is the first tailored infrared light source for sustained deep dermal heating with the most frequent use on the face, submental area, neck, and abdomen. It can be used on all skin types, including tanned skin. 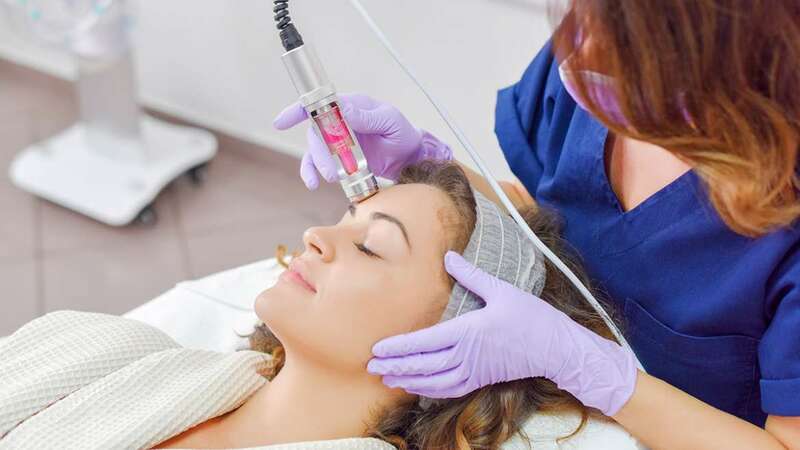 Laser Genesis procedure is a no-downtime, pain-free, year-round aesthetic treatment, designed to help polish and perfect superficial skin revitalization concerns. It utilizes non-invasive laser technology to safely and effectively improve fine line wrinkles, pores, diffuse redness, rosacea, acne, and scars. You can expect to see consistent results after each treatment. Treatments can be performed in a relaxed, comfortable manner without the use of topical anesthetics or gel. On average, you may require 4-6 treatments in order to achieve optimal results. This is the perfect treatment before events to refresh the skin glow. Pearl Fractional anti-aging laser is a single treatment solution for skin wrinkles, enlarged pores, irregular skin texture and acne scarring. It addresses deep-set imperfections and tired/weathered skin in one-treatment session and supplies the perfect complement to a surgical procedure requiring moderate downtime. Fractional therapy describes a treatment that exposes only a fraction of the skin to the laser beam in a pattern of tiny dots. With Pearl Fractional, laser pulses place tiny holes in the skin. Columns of damaged tissue are selectively removed, leaving surrounding skin intact. After a treatment, the body’s own natural process creates new collagen improving the appearance of fine lines and aging skin. This treatment requires post care at home for about 5 days. Fractora is the most advanced fractional radio-frequency treatment which helps decrease wrinkles, improve skin complexion, reduce skin irregularities (including acne/acne scars) and provide a healthier younger looking you. Fractora uses a radio-frequency which is color-blind technology that can be used on skin of all color. Radio-frequency energy heats the deep layers of the skin in a controlled way to revitalize the collagen. Fractora delivers radio-frequency energy to the skin through an array of pins producing localized heat and small micro-lesion dots. The gentle heat generated by the Fractora pins in the sub-dermal tissue promotes collagen restructuring for skin rejuvenation and an improved appearance in the skin. Amazing results for acne, acne scars, skin laxity (sagging skin) and wrinkles.